Your Choice. Just Consider it Wisely. In this column, I express my humble but considered opinion on the political flap of San Francisco 49er Colin Kaepernick’s not standing for our national anthem at National Football League (NFL) games. I’ll try to set forth an opinion that you may not have heard elsewhere—if that’s possible! First—there is nothing that I can find in U.S. code prescribing a legal obligation to stand for the national anthem. It’s a time-honored tradition and American value. We love our country and we are proud to stand when our anthem is played. Just consider the many Olympic Games where world nations assemble on the friendly fields of competition. We strongly demonstrate our love of country during those moments. The operative word there is should. Therefore, it is a lot weaker than shall or will, which of course would indicate an obligation to do so. In my opinion, a person is not breaking the law by refusing to stand and place his hand over his heart for the national anthem. Here’s where the complicated part comes in—not standing may run afoul of administrative requirements of professional organizations, commercial enterprises, or other types of organizations. For example, if the NFL has a requirement that all of its players must stand for the national anthem, then those who do not would be subject to whatever sanction that the NFL provides in that case. To be even more sure of that, the requirement could be made part of the player’s employment contract. This is entirely possible because such a contract does not stand in contradiction to any law. Every Tuesday morning, I attend a Rotary International meeting. It’s hard to conceive that the Rotary would be happy with my continued membership if I refused to stand for the Pledge of Allegiance to both the U.S. and Texas flags. They wouldn’t care what my reasons were—I would be asked to just discontinue my Rotary affiliation. In summary, Kaepernick doesn’t appear to be in violation of any U.S. law or NFL administrative requirement. He is, however, in extreme opposition to our American values to render respect to our nation and all those who fought, were wounded or gave their lives for it. His actions fly in the face of what we know to be right as citizens. I am disappointed in his actions for those reasons. He is not a role model for anyone. I suspect that like many young people, he is another victim of revisionist history or just totally ignorant of U.S. history in general. I recommend that he start rendering service to others in the community so that he can start to focus on things other than himself. We certainly get into big trouble in life when we begin to be #1 fan in our own fan club. For example, he could help veterans in the hospitals or facilities where they suffer from war injuries and Post Traumatic Stress Disorders (PTSD). These brave men and women don’t earn the millions of dollars that he does every year. They are among the greatest Americans and most suitable role models that we have. Maybe he would gain a whole new perspective on life and our nation. But if Kaepernick still decides to “take a knee” during the national anthem, perhaps he could get on both his knees and pray for those in harm’s way, protecting his right to throw a ball and earn his living in our great America. Author: Bob Brescia serves as the executive director of the John Ben Shepperd Public Leadership Institute. His latest book is Destination Greatness – Creating a New Americanism. Bob has a doctoral degree with distinction in Executive Leadership from The George Washington University. He also serves as chairman of the board of Basin Public Broadcasting Service. Email: [email protected] or Twitter: @Robert_Brescia. 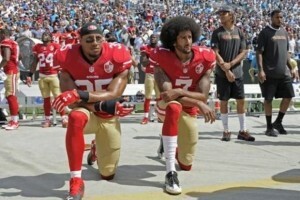 What is Kaepernicks point other than to draw attention to himself because he isn’t playing? Has he put his money where his mouth is yet? I suggest that those who are offended take a hard look at themselves and quit blaming history for their issues. Read Thomas Sowell and Walter Williams for insight. There is no question we have problems in this country, but take a look at the rest of the world and then decide just how bad it is in comparison and your ability to do something abut it in a positive way. As for me and mine we will continue to honor the flag and the promise it holds for all and work to make it come true for all. I had hoped this article would be enlightened however i found it very offensive and totally missed Kaepernick’s point.I would suggest the author spend more time in communities other than his own to understand their concerns and the view point he does not understand. This article is delusional, offensive, and makes a lot of assumptions. I think the author needs to spend some time with black people that America has let down. Who have had all the promise of America denied them. Maybe that will give him a fuller context. Most likely it will not. If the United States lived up to its creed, the point would b pot. Save the patronizing pointless essay for the undergrads.